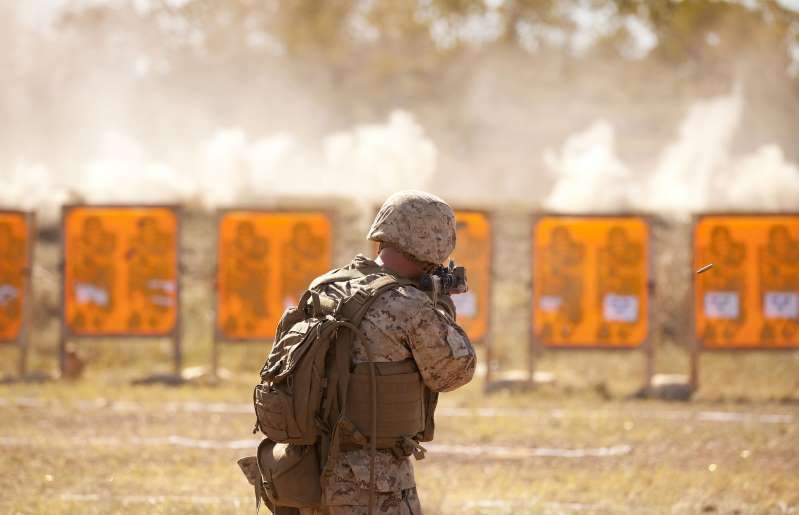 A member of the U.S. Marine Corps trains in Australia's Northern Territory. The U.S. military has revealed that a U.S. Marine was shot by a member of allied Syrian forces in February, but an internal investigation apparently could not determine whether the act was intentional or accidental. On Wednesday, Task & Purpose revealed an exclusive report detailing what appeared to be a "green on blue" attack on February 17 by the U.S.-backed Syrian Democratic Forces against Sergeant Cameron Halkovich, a member of U.S. Marine Corps 2nd Battalion, 7th Marine Regiment deployed in eastern Syria. The incident reportedly occurred the night after an apparently racially charged encounter, in which the majority-Kurdish local forces denied aid to Arab civilians, prompting a tense verbal exchange. [post_ads]After the U.S.-led coalition initially told the outlet it had "no recorded incidents of insider attacks" during its anti-Islamic State militant group (ISIS) campaign in Iraq and Syria, the U.S. Central Command published on Friday a statement acknowledging the attack, but determining that the investigating Marine colonel was "unable to conclusively determine if the Marine was shot intentionally by a Syrian Democratic Forces guard, or if he was shot as the result of a negligent discharge." Citing sources familiar with the matter, Wednesday's Task & Purpose report alleged that the Syrian Democratic Forces guard waited for Halkovich in the shadows of their shared military base and ambushed him, firing two shots through his leg. Halkovich's partner Corporal Kane Downey heard the shots and saw Halkovich lying on the ground with the armed Syrian Democratic Forces member above him, according to the article. He then shot the gunman dead. Halkovich survived, and Downey was set to receive the Joint Service Commendation Medal over a "shooting incident," in which he "acted decisively to eliminate the threat to his comrade," Task & Purpose reported, quoting the award citation, which did not identify the shooter. In Friday's press release, Central Command appeared to confirm Downey's award after it was "determined that a second Marine on the scene, believing himself to be in imminent danger, acted appropriately and proportionally to the threat he perceived." "Those actions in the face of the perception of imminent danger, and the second Marine's life-saving response to a fellow Marine's injuries, led the lead investigator to recommend the second Marine to be commended for his actions," the press release said, adding that "the investigation will be released upon classification review." The U.S. first became involved in the Syrian conflict by supplying covert aid to various insurgent groups trying to overthrow Syrian President Bashar al-Assad, who the West and its allies have accused of war crimes, after a 2011 uprising. This assistance dwindled with the opposition's increasingly Islamist leadership and the rise of ISIS, which became the focus of U.S. military intervention in 2014. The following year, the U.S. began backing the Syrian Democratic Forces, which include both Kurdish and Arab fighters, as well as members of other ethnic communities in Syria. With the Russian and Iranian support, the Syrian military has retaken most of the country from rebels and jihadis, leaving the government and the Syrian Democratic Forces as the two most influential actors in the war-torn country. The latter's political wing has begun negotiations with Damascus in hopes of securing a limited autonomy in exchange for returning to the government key facilities—including a major dam and potentially the lucrative oil fields in eastern Syria—where tensions between the local Arab majority and Kurd-led forces have proved troublesome for U.S. plans.